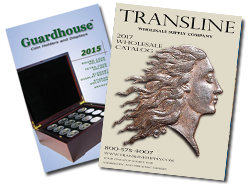 Transline carries a number of Coin Tube brands , including Numis, Guardhouse, H.E. Harris/Whitman coin tubes -- the standard brands in the coin collecting industry. Coin tubes are an ideal way to store coins in bulk stacks, and offer a more secure, longer term storage solution than paper coin wrappers. Round and square tubes sold here feature removable lids, making the contents easily accessible to the coin collector. Made of impact resistant, high quality materials, coin tubes are a practical, economical and reliable way to store and protect coins, as well as silver and gold bullion. Coin tubes come in square or round configurations. We stock H.E. Harris round tubes made of crystal clear polystyrene or semi-transparent polypropylene. Sold in bulk retail display boxes of 100 each, HE Harris round coin tubes feature a screw-type lid closure. Square coin tubes include the Guardhouse and Numis brands, and are made of opaque, impact resistant polypropylene. Square coin tubes have a snap-tight lid closure, and are sold in bulk boxes of 50 or 100 coin tubes. All coin tubes have sturdy caps that close tightly, preventing coins or rolled coins from falling out. Guardhouse is a Transline in-house brand. Transline Supply, Inc is the direct manufacturer and marketer of Guardhouse branded products. Coinsafe 10-count quarter coin tubes are built with high quality materials designed to provide your quarters with long-term, safe preservation. Coinsafe tubes are opaque and have strong and sturdy caps that snap to the tube base firmly. This 10-count quarter tube is ideal for "America the Beautiful" National Park and Statehood quarters yearly P & D sets. As a world leader in coin protection, CoinSafe products are always Made in USA. Note: Photo does not accurately reflect the opaque color. These colorful, attractive point of purchase boxes make a great retail display while maximizing space. Each box of 50 is clearly labeled from the outside; 600 tubes per case. Guardhouse's new coin tubes feature a unique, proprietary design and are the perfect solution for storing large dollars. Sleek and ergonomic, the Guardhouse translucent snap-tight lids and tubes allow for easy identification of their contents and stack for tidy storage. These colorful, attractive point of purchase boxes make a great retail display while maximizing space. Each box of 50 is clearly labeled from the outside; 600 tubes per case. 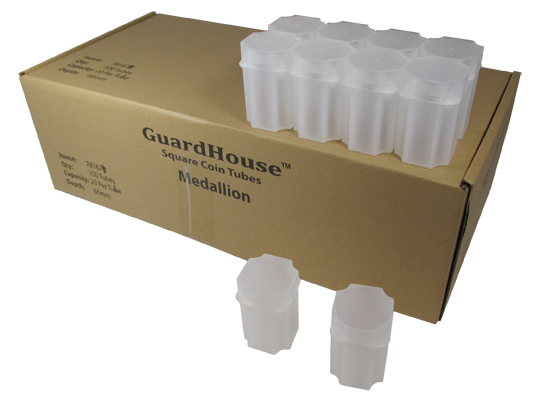 Guardhouse's new coin tubes feature a unique, proprietary design and are the perfect solution for storing your 66mm medallions. Sleek and ergonomic, the Guardhouse translucent snap-tight lids and tubes allow for easy identification of their contents and stack for tidy storage.